I think some of our freeway traffic problems and resulting costs and gridlock caused by accidents could be solved with a few signs such as "Slower Traffic Keep Right" or "No Passing on Right" signs. "Exploding tires have been blamed for 101 deaths in the United States in the past eight years, but distracted, poorly trained drivers who drink coffee and talk on mobile phones may have more to do with the high death toll on American roads. More than 41,000 deaths were recorded on American roads last year. Experts say American drivers break road rules, are frequently distracted and aren’t often trained to handle emergency situations. In European countries with faster, safer roads, people wonder: Are Americans just bad drivers? “I’ve driven a lot in Germany. Your average American wouldn’t stand a chance over there,” says Robert Sinclair Jr., spokesman for the Automobile Club of New York. "...Sinclair says the good safety records on German roads are particularly surprising because Germans drive so fast. Speeds over 140 mph are common on the nation’s autobahns, he said." “There are strict speed limits in the [neighboring] Netherlands. As soon as you hit Germany, if your window is open, you can hear engines begin to scream as they accelerate to German cruising speeds,” he says..."
" The biggest difference between the two countries isn’t in tires, but driving habits, says Alex Landsdorff, press attaché at the German Embassy in Washington. German drivers actually obey the rules, he says. They don’t cruise in the left lane, they keep both hands on the wheel and act predictably." “You know what the guy behind you’s up to and you know what the guy ahead of you’s up to. That’s never the case [in the U.S.],” he says. "At German speeds, drivers are less likely to become distracted — they don’t shave, put on makeup, play with the CD changer or do the various things that lead to American drivers taking their eyes off the road, says David Champion, head of Consumer Union’s auto testing center in East Haddam, Conn.
“It’s very difficult to find cupholders and the like” in European cars, he said. But American drivers, accustomed to doing other things while driving, continue their dangerous habits even at high speeds, he says. " " The renowned British stiff upper lip may also play a role. Though that country coined the term “road rage,” expatriate American Janice Murphy says she’s noticed British drivers are much less aggressive there than in her home state of New Jersey. “You still have very much more courtesy and abiding by the rules in England. Someone will go zipping by at 100 [mph] , but they’ll do it in the appropriate lane,” says Murphy, who has been living in London for 11 years. these signs work if people actually would read them. if people still drive on the left on higways, why would they start driving on the right on city streets? One thing that annoys me about the Yellowhead and Gateway are these big-rig trucks that occupy each and every lane side-by-side. Once the Yellowhead is completely up to a free-flowing standard, it should have at least 2 car-only lanes. That's certainly the primary difference. Secondmost difference is vehicle conditions. Strict re-inspections there (annually?) ensure that billy-bob's third-generation-stolen pickup rustmobile would never see pavement again. Standard emissions testing would solve that....buck up and match your emissions to current standards or sell the car! But who ever admits to being slower? I've actually found US interstates much better than Canadian roads in that regard. But is that because their signs say "keep right except to pass" rather than "slower traffic keep right"? Or is it because Canadians, though polite and civic minded are also notoriously non-conformist? I remember reading a study where they saw how many people to took to form a que or line up... in some countries it took only 2 people before others would form a line. I think England was about 3 and the U.S., bastion of individuality, took 7 people before otheres would form a line behind. For Canada they quit counting at 12 because we never formed a line. What really astonished the authors of the study though was that while we never formed a line, everyone took their turn. For some reason though, we don't work that way behind the wheel. A friend e-mailed me an article last year from Florida, believe. that planned to ban driving in the left lane except to pass. Honest! I've thought of suggesting somewhere, that as a compromise (to our road safety unfortunately )... that cell phone users be banned from the left-hand lane. The slower right lane concept on the QE2 works well until you get to Leduc where it becomes 3 lanes each way. I find that drivers get confused as to where the fast lane is, and it ends up being a dash to Edmonton regardless of what lane you are on. ...I've actually found US interstates much better than Canadian roads in that regard. .. I think it depends where you are. I haven't driven much in the US, but on a trip to California I found that the users of San Francisco area freeways followed the slower traffic keep right rule religiously, but near Seattle it was a random speeds in random lanes free-for-all. Very astute observation. It's always riddled me also. Texas is legendary for its lane-speed free-for-all. It's like driving in a video game there. The third lane issue has always confused me - is it considered a "merge" lane or is it the "slow" lane? On the Whitemud it goes for miles so I assume it to be the slow lane but a lot of Edmontonians treat it like a passing lane. Off topic... and then there's the issue of people going 3/4 the way around a traffic circle in the outside lane or 1/4 way on the inside lane. I always thought such drivers were insane and breaking the law but a friend confirmed with the City Police that one or both of those crazy moves are actually technically legal. I wish though the city would put up signs dissuading such driving. (eg traffic circle by Valley Zoo). Seems that in Germany, they know how to make things work at far, far higher speeds. Like he says: "At 230 km/h you're covering the length of an NHL hockey rink in less than one second. " Note the accident stats between Germany and Canada. German drivers are impeccably disciplined when it comes to staying over to the right. They move left only to pass. The left lane hog hardly exists in Germany, or, if she or he does, likely they're tourists. The elite autobahn polizei strictly enforce the rules of the road. Where there's no speed limit, enforcement is all about dangerous lane changes, passing on the right,..."
Enforcement is the key however I'd venture it's easier effectively cover the motorways in a nation of 80m that occupies half the space as Alberta. I love these signs on Vancouver Island (are they all over BC? ), and it seems the average driver understands the message. 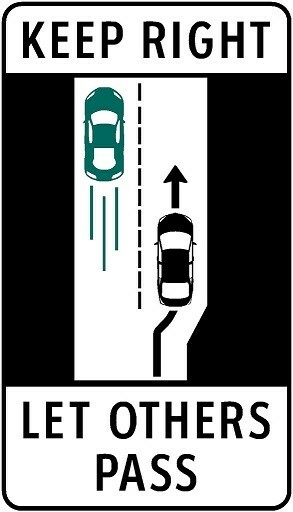 We need these in Alberta to help the left lane dolts get the point. I seriously think the left lane slowpokes are people with absolutely no control in their lives so when they hold up traffic they feel like they actually have some control in their life. Dummies. From what I saw on a motorcycle trip through BC a few weeks ago, they're no better or worse at saying right except to pass than Albertans are. Lots of dummies staying in the left lane despite there being no one to pass. Or, even if there is another vehicle up ahead to pass, it's half a KM up and they could easily move over and let the stack of traffic behind them past, but they'll just stay in the left lane and take a couple minutes to make the pass. I notice that too every year I make the trip to Van Isle, but I disagree as Albertan's have to be the worst when it comes to this. No wonder we get the sh1tty, entitled driving reputation we have. These signs are all over BC... mostly found where there are only passing sections, and the rest single lane/undivided highway. The absolute worse thing on Alberta highways is where there are 3 driving lanes, and nobody uses the far right lane. Move the fuckss over if you have more than 2 axles and are driving at or under the posted limit. Drives me bonkers when there's one guy in the middle lane doing the 100, guy in the left beside him trying to pass doing 101, and the rest of the traffic wants to go 110+ and forced to bypass these idiots in the right lane. Alberta driving classic right here. Last edited by Medwards; 04-10-2016 at 04:00 PM. ^ There are far too many truckers doing 105 km/h in the middle lane between Leduc and the Henday, but anyone driving under the speed limit should be in the right lane, not just the truckers. Yeah, I'm from northern BC (grew up there and went to university in PG) and most people follow these signs pretty well, when there is a passing lane. Any time you see a BC plate, they will mostly be following the rules. Even if someone is in the left lane, generally if they see you approaching, they will move over and let you pass. Sometimes with all the Alaska Highway traffic, you get people not from BC that get confused, but it works fairly well even in that case. This isn't an Alberta/BC thing though. I spent a couple 6-month winters driving the US south (and west/east) and wherever there's non-trivial truck traffic this seems to happen, one lumbering elephant doing 1% over the speed limit wanting to pass another elephant. The very worst was I-10 from El Paso to Dallas, through the Odessa-Midland corridor, heavy West Texas oil presence especially during the $100/bbl times, a phenomenal amount of truck traffic pretty much dictating speeds for an excruciating length of highway. solution for truckers is to give them a slower speed limit like they do in many parts of america. Shouldn't that be right lane except to pass? I've been on the QEII south of Bowden when it took over 15 minutes for one semi to pass another. "drivers are expected to maintain a distance in metres of roughly half the..."
Actually, I just drove to Edmonton from Red Deer yesterday and I noticed that someone installed these signs on QEII. I only saw two different pairs of them tho. There is a pair just north of the Highway 53 overpass and a pair just south of JT's Highway Diner. They look to be very new. I have traveled this corridor many times before and this is the first time I have seen them. They've always had the white 'slower traffic keep right' signs, but most people seem to think that just applies to farmers. I believe it's Nevada that has a law that if there's more than 5 cars waiting behind you on a highway, you must pull over and let them pass. Yes. I agree. Those 'Slower traffic keep right' signs have always been there. But these new 'Keep right - Let others pass.' signs must have just been installed. I'm beginning to wonder if it's the start of an AB Transportation education campaign or something. Maybe it's a pilot project to see how drivers respond?? Last edited by the.tru.albertan; 05-10-2016 at 11:47 AM. I've noticed a ton of those signs throughout Montana, Washington, Oregon, Idaho, Wyoming and so on while on motorcycle trips. And Americans generally are very good about obeying them. In fact, Americans in general I've found to be far more courteous to motorcycles than Canadians. Even if there aren't signs like that present, they'll often pull over and wave you past. At construction zones you'll typically get waved to the front by the flag person, as well. I did see some of those "5 cars" signs in BC recently. I don't recall if it was on the Nicola highway, or out towards Tofino. Back in the day, many many moons ago (the 70's) the signs used to read..
"KEEP RIGHT EXCEPT TO PASS"
This to me lets each individual decide what the law means, whereas the first one is definite as to what to do. I traveled the QE2 on the weekend and for the most part the drivers kept the left lane clear for passing, however there were a few insane times when there was nearly a massive pile up because of an inexperienced or perhaps stubborn driver that just wouldn't move while the highway backed up behind them. Now that the Henday has opened and I use it many times a day, there is ZERO signage stating to keep right and most Edmontonians have no idea how to drive on a "BIG BOY" freeway and think they are driving down 66th street for a nice Sunday drive. From this it looks as though the standard is RB-35 for divided highways and RB-34 for single track with passing lanes, however there appears to be an example of using the RB-34 on freeways and divided highways when an extra lane is added to remove congestion. Last edited by KenL2; 05-10-2016 at 02:44 PM. I lived in Germany for 4 years, and loved driving over there. Everyone follows the rules and expects everyone else to do the same. On highways (autobahn) you stay in the right lane unless you're passing, period. If you're driving in a middle or left lane and not passing anyone, you can and will get pulled over by the police. I'd been told you have a limit of about 30 seconds to get back into the right lane. It's very common to see cars that are going much faster switching in and out of the right lane as they pass cars. Every time they pass a car they get back into the right lane until they approach the next one, and repeat. There are no set limits the majority of the time, except if there is congestion or an accident up ahead. The highways have electronic roadsigns everywhere which will display speed limits and an icon showing either accident, or congestion. As you get closer to the slow traffic, the speeds on the signs get lower, sometimes down to 50 because traffic is actually stopped or crawling. So you'll be cruising at 200 and start seeing signs that say 130, 100, 70, 50 etc. Then after the congestion, you get the "no speed limit" sign again (A white circle with a black line through it). Transport trucks, and ANY vehicle pulling a trailer cannot exceed 100km/h, even on the autobahns with no speed limit. Most stretches are also restricted to where they MUST stay in the right lane, they're not allowed to pass anyone. This really helps with the flow of traffic because there's no "elephant races" where transport trucks are passing each other. There's also the highbeam flashing courtesy. For example, you are in the left lane passing cars doing 200 km/h, and there is a car ahead of you in your lane also passing cars but only doing 140. You flash your highbeams to let that car know that you're coming up on him very fast. The car doing 140 will find a spot to move over into the right lane and let you speed by, and then change back and carry on doing 140. Or, the car will sometimes just speed up. This is something important to know when you're driving over there (keep an eye on your rear-view mirror no matter how fast you're going). If you see a car way behind you flashing highbeams, get out of the way because he could be doing 200, 250, 280, and he'll be right on your behind in no time. Cars without cup holders in Germany is also a real thing, but they do have ash trays. I bought a BMW when I was there and it had no cup holder at all. But Germans don't sip their coffee when they're driving. Partially because of how dense the population is, and the fact that there are rest stops and gas stations that you can pull off into all over the place. This is not the same as in Canada with our long stretches of highways between cities, where there might not be a rest stop or gas station for an hour or more. So we need to bring our drinks with us. In Edmonton, there are many places where I think it's fine to not have to keep right, such as on the Henday where it's 3 lanes and there are several on and offramps. Stay in the middle lane to make it easier for people to merge in. I do agree however, that the left lane should be reserved for "faster" traffic and you shouldn't be in the left lane on the Henday doing 80 unless the weather calls for it. EDIT: I failed to mention that the German highways (autobahns) are also very distraction-free. There is a high barrier, or wide division between opposing traffic, and the sides of the highways are lined with tall thick trees. So there's really nothing else to look at. There's also ZERO advertisements anywhere on the autobahn. It's very much a "focus on the road" environment which I enjoyed. Last edited by alkeli; 13-01-2017 at 09:16 AM. That sounds wonderful. Too bad many people around these parts are either too stupid or entitled for something like that to ever work here. Is the left lane just reserved for passing? Sometimes, the left lane is the right choice – even if you're not turning left or passing another car. "Drivers are required in Nova Scotia to drive in the right lane unless passing, but there are always exceptions," said Cpl. Jennifer Clarke, Nova Scotia RCMP spokeswoman, in an e-mail. "It's a best practice to move to the left if it's safe when you're approaching an on-ramp and there is a vehicle entering the highway – not a requirement but a best practice. If the right lane has some sort of hazard, it's reasonable to drive in the left lane until you've passed the hazard." Section 111 of the Motor Vehicle Act states: "a vehicle shall normally be driven in the lane nearest the right-hand edge or curb of the highway when such lane is available for travel"
"Driving at the speed limit doesn't entitle you to 'camp' in the left lane which means to stay in the lane indefinitely," says the Nova Scotia drivers' handbook. "If you remain in the left lane, other drivers may try to pass you on the right. Passing on the right is not as safe as on the left because it is much more difficult to predict what everyone is going to do." The rules vary across Canada. In Quebec, the law bans driving in the left-most lane on highways with limits over 80 km/h unless you're passing or turning left. You can't even be in it if you're the only vehicle on the highway. In B.C., you have to get out of the left lane if another car is coming behind you. But other provinces, including Alberta and Ontario, just require slower traffic to keep right. In Ontario, section 147 of the Highway Traffic Act (HTA) states any "vehicle travelling upon a roadway at less than the normal speed of traffic at that time and place shall, where practicable, be driven in the right-hand lane…"
Last edited by KC; 23-02-2018 at 09:23 AM. Here’s the a link to the article in the first post. In large cities we get an urban variation on left lane blockage - middle lane morons who amble along slowly in the centre lane of a three-lane highway. “Road tolls aren’t the problem — it’s road trolls. You know the beasts. Road trolls. Highway hogs. Slowpokes. Passing lane plodders. Middle-lane malingerers. They drive anywhere but in the far right lane, where they belong, and nothing short of a thermonuclear bomb will dislodge them. Passing on the left is strictly enforced. On the Autobahn, like most roads in America, the left lane is strictly the passing lane; for everything else you must keep right. If you're not passing anyone and you're just traveling, you have to move your car over to the right. The main difference between the two countries is that in Germany, motorists actually respect this rule. In America, it rarely happens. Because Germans pay such close attention to this rule, traffic is able to flow much more freely on their highways. Last edited by KC; 21-05-2018 at 02:48 AM. Why do some drivers stick, limpet-like, to the central lane? Since traffic normally moves at the maximum posted speed, and anything above that deserves a immediate stop by the traffic police, there is no need whatever to restrict the left lane to passing only. Any vehicle that is unable to keep the maximum speed should of course use the right lane, and that is why the "slower traffic keep right" rule makes perfect sense. But otherwise the left lane is in no way a passing lane. Laws that claim otherwise must be struck down, and the illiterate snowflakes who keep whining on about it must be silenced. Fbelow, mostly for a speed limit thread, but there’s contradictory evidence on the speed limit issue below but most sides with higher speeds kill more people because of the forces involved and not necessarily a change in habits due to higher speeds, but rather simple physics. Would a higher speed limit just cause everyone to drive faster? The research suggests not, writes Jim Kenzie. Raising speed limits to save lives — sounds counterintuitive, doesn’t it? For example, it is intuitively obvious just from looking out your window that the world is flat. Anyone who says differently might be burned at the stake. OK, so Galileo was only imprisoned. ...More recently, Lt. Gary Megge of the Michigan State Police has expanded on these ideas. Notably, that traffic is generally going to drive at the speed at which the road was designed to be driven — typically for a modern freeway, around 120-130 km/h. “Do our politicians have the courage to be correct for a change? We can only hope. Last edited by KC; 21-05-2018 at 03:10 AM. “The test revealed that, under normal conditions, more than 75 per cent of drivers travel above the 100 km/hr limit, with many drivers going 120 km/h. Marketplace also analyzed the traffic data for the 85 percentile, a measure used by engineers and provincial authorities to assess speed patterns, and one of the tools used to establish safe speed limits. The number represents the speed that 85 per cent of drivers travel at or below. Stone says if most drivers are speeding, then the speed limit is not effective and should change. "There's no point in having a sign on the side of the road with a posted speed that drivers are not actually obeying," says Stone from the B.C. transportation ministry. "You want to make sure that your speed limits are in alignment with what 85 per cent of the traffic is doing." Last edited by KC; 21-05-2018 at 02:13 AM. ...“For decades, it’s been an article of faith among many traffic engineers that posted speed limits should be set at approximately the 85th percentile of observed auto speed — that is, the speed at which 15 percent of motor vehicles are driving faster and 85 percent are driving slower. That principle was enshrined in one of the traffic engineers’ bibles: the Manual on Uniform Traffic Control Devices, maintained by the Federal Highway Administration and largely written by the NCUTCD. Last edited by KC; 21-05-2018 at 02:36 AM. Our region seems to have a tremendous problem with distracted driving and left-lane camping. On left-lane camping, it’s pretty simple. State law requires that you drive in the right lane unless you are passing on roads with two lanes in the same direction. This does not apply to the HOV lane. One issue that is very common in the Seattle-area is the belief that if you’re driving the speed limit you don’t have to get over. That’s just flat-out wrong. And here’s the key: it isn’t your job as a driver to monitor others’ speeds or to slow them to the speed limit. Left-lane camping is dangerous. It forces other drivers to make unsafe lane changes. It causes unnecessary congestion, and it can cause accidents, according to the state patrol. Please move right. Last edited by KC; 21-05-2018 at 03:04 AM. Obviously you have never driven in Europe. I’ve come to the conclusion that in order to get anywhere fast, that wherever there are three lanes in one direction, I should Take to the right hand most lane. For instance, on the Henday where 3 lanes can continue for several km, the “left lane hogs” will just sit there without moving over, so they just back up a pack of vehicles. Then anyone that come on the freeway immediately takes to the middle lane. Additionally there are absolutely no signs indicating that slower traffic should keep right. There are absolutely no signed suggesting anyone should let vehicles pass (unlike on the QEII). The right hand lane has zero signage suggesting that it it an acceleration or deceleration lane or merge lane for the on-ramps. Therefore while it’s counter to everything I learned in driver ed, I now figure it’s the best lane to take to in order to pass the greatest number of slow drivers and all those poor people feeling trapped behind them, because old-school rules say you should never pass on the right. They should have signs like Europe uses indicating the km length of the right hand lane. Simple effective and drivers know that they can drive in it. If the lane is just a short merge or acceleration/deceleration lane then that should be stated. As an aside: I’m amazed at the number of people that will sit in my blind spot for long long distances. I guess the side vehicle detectors mean that that’s no longer part of basic driver training either. Last edited by KC; 14-09-2018 at 09:45 AM. Last edited by KC; 14-09-2018 at 09:40 AM. Yes it’s wonderful! Yet still can’t find an example of it (photo of sketch) on the Internet. The other week I watched a driver “camp” in the left lane. People kept coming up behind him and eventually passing him on the right. Ag one point he pulled over to let people pass but then moved back into the left lane when there was no one for a long, long way in front of him when he was in the right hand lane. Just unbelievable! Repeatedly screwing up safe smooth traffic flow for no apparent reason. A few weeks before that, a guy in a large newer pickup truck (Sask plates) towing a large trailer (over the speed limit) but just not moving to the right when clearly able to. Again backing up traffic in the left lane. Another fricken amateur driver. Last edited by KC; 14-09-2018 at 10:07 AM. Last edited by KC; 14-09-2018 at 09:55 AM. Being back in Edmonton this week after being away for several years, I see the big difference in Edmonton drivers. I had to travel out to the airport 3 times and was surprized by the heavy volume of traffic on 4 lanes and the traffic speed was quite consistent between 105 and 115 across 4 lanes. In Montreal for example you often have people who cruise at 80 on a 100kph highway in the 2nd lane and others doing 120. The right hand lane is almost empty. On the QEII to the airport I saw trucks in the 2nd, 3rd and 4th ( left most lane )doing 110. No where else in Europe, the US or Canada have in ever seen trucks in the extreme left lanes except to pass. There were zero trucks in the right lane on the QEII. In Europe trucks are limited in many places to 90 and their are in long convoys in the right lane. In many places trucks are limited to slower speed and only can be in the right lane. Years ago the QEII had slower speeds for trucks and all traffic was limited to 100 at night. Looks like they change the laws for the highways. The Alberta government fails to enact laws that are common elsewhere that would increase safety, courtesy and traffic flow while not even enforcing and educating people to follow the laws. Last edited by Edmonton PRT; 16-09-2018 at 09:30 AM. He probably moved out around the time he stopped shilling for personal rapid transit in three-quarters of his posts, and took up hard-assed superiority. The city did better without him around. Yes Ashetsen, you have done so well to fill my place with your own brand of hard-assed superiority. Just because one didn't fire a gun and someone else did, that shouldn't deminish the ower's responsibility as an owner of that vehicle. They should be held reponsible for lending vehicles to such characters. Was that vehicle stolen? I agree. If you don't know who is driving YOUR car, then you should be held responsible. 99.9% of the time, people are driving their own car. In California front licence plates are mandatory and photo radar captures the front of the car, which can identify the driver. Last edited by KC; 17-09-2018 at 07:06 AM. “Two-thirds of respondents said they believed their skills are above average. And 88 per cent said they would pass the written test if they had to take it again. My neighbours son who is 15-1/2 just passed his written test in Quebec. It took him 33 minutes to complete the long version test and he aced it. 100%! He said that the class report shown that 55% of the class failed the test, with most of them adults and 12% failed to complete in the 2 hour time limit. Yeah I’d be in favour of a short annual or biannual online refresher course and test that covers some set proportion of the rules. Cycle through them over some set timespan (5 yrs, 10 yrs...). Then repeat. Any new laws could be covered repeatedly for 3 or 4 years to ensure they are learned and not forgotten plus, by repeating it, the training could be modified to improve effectiveness. Agreed. A 30 minute refresher video before a biannual test. If you fail you could take the written test again but also a road test. A licence is a privilege not a right. Alberta used to have mandatory vehicle inspections and those should be biannual as well. They love Top_Dawg's General Lee dixie horn. The Alberta government would never enact stronger inspections and driver testing. They fear the rural backlash at the voting booth.